Given the decrease in water availability and increase in water price, there is a strong need for farmers to improve water use efficiency. In 2006, Southern Rural Water engaged consultants to consider the future of on-farm irrigation in the Macalister Irrigation District (MID). This study identified that subsurface drip had the potential to address constraints that acted as barriers to change to more efficient systems. Subsurface drip irrigation (SSDI) was believed to generate higher crop production, can service odd shaped paddocks, had the potential for water savings, operates at low pressure, and has low labour requirements. 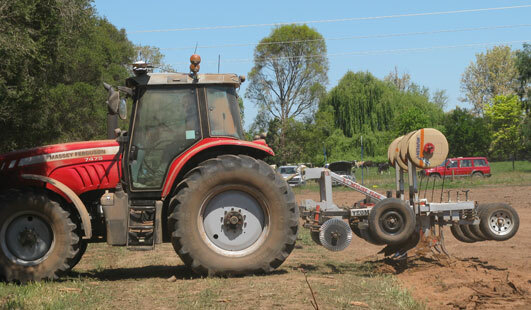 The SSDI irrigation trial at the Macalister Demonstration Farm involved the design and installation of 7 ha of subsurface drip irrigation with an emitter spacing of 500mm and a tape spacing of 800mm. The system was operated and monitored for three irrigation seasons (2008/09-2010/11). Monitoring of water use, pasture production, pasture quality and soil fertility was undertaken over this period to assess the resource efficiency of the system as well as its profitability. Two other freshly sown sites on the farm, one under fixed sprays and another under lasered flood irrigation, were monitored for comparison. Active supervision is required to ensure that the system is installed and performs according to specifications. Optimum tape spacing is the key to maximising pasture production and water use efficiency but this needs to be balanced with the extra material and capital costs as tapes are moved closer together. High level performance of the system requires careful monitoring of soil moisture levels in the root zone and irrigation management matched to soil characteristics. SSDI is expensive. While the potential for high levels of pasture production at a lower than district average irrigation water usage were seen, the magnitude of production levels or water savings are not sufficient to justify investment in SSDI in the MID at a tape spacing of 800mm. On a broader stage, there appears to be little need to pursue further research or demonstration of SSDI for dairy pastures.